A day like today won't happen again for another century! 3/14 has been Pi Day every year for the past twenty-seven years, but this is a special one. It's 3/14/15...and check the time of this post if you want an additional nerdy chuckle. 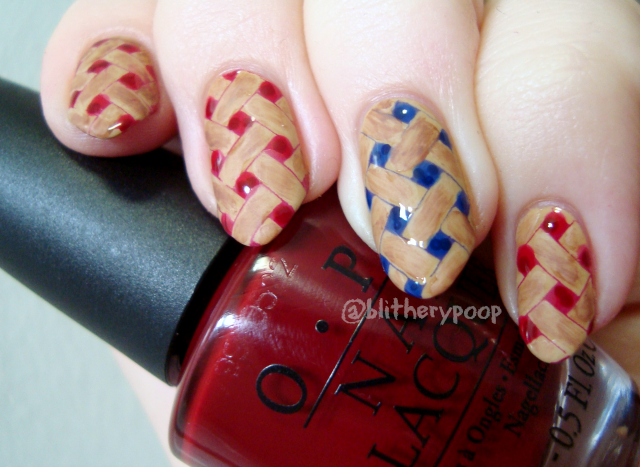 I had to commemorate this special moment with pie nails! 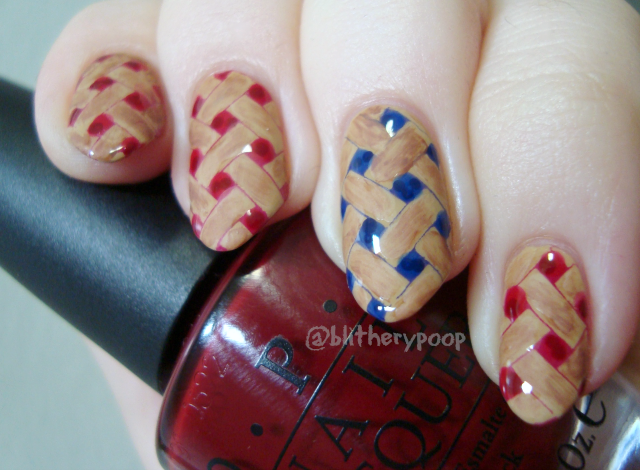 This started with Sephora by OPI Neutral Beauty, which is about as close to pie crust color as a polish could get. Then I stamped it with the lattice image on Vivid Lacquer's VL 009 plate (currently out of stock), using Ulta Steppin Out and an accent of OPI...Eurso Euro. I "baked" the crust with a small, flat nail art brush and Sally Hansen All Bark. Next I dotted cherries and blueberries with OPI Got The Blues For Red and Essie No More Film. For the goo around the berries, I dotted on L'Oréal Jolly Lolly and Miss Pixie for the two "flavors". OPI Matte Top Coat applied with a dotting tool to just the crust parts finished the look. Know what else turns twenty-seven this weekend? My sister! If you like things that look like food, but aren't, follow her. She makes cute clay jewelry and other accessories. Between these pie nails and this watermarble, I feel like I've accidentally channeled her lately. Happy birthday, kid! *giggle* Strategic posting time, I see. I love this nail art! It's so realistic looking! Using the Miss Candy Jellies was genius. Happy birthday to your sister, and happy ULTIMATE pi day!